The most valuable training tool in the gym! Athletes can learn perfect technique on skills in a fraction of the normal training time. Multiple repetitions of tumbling and gymnastics skills are easy on the body. 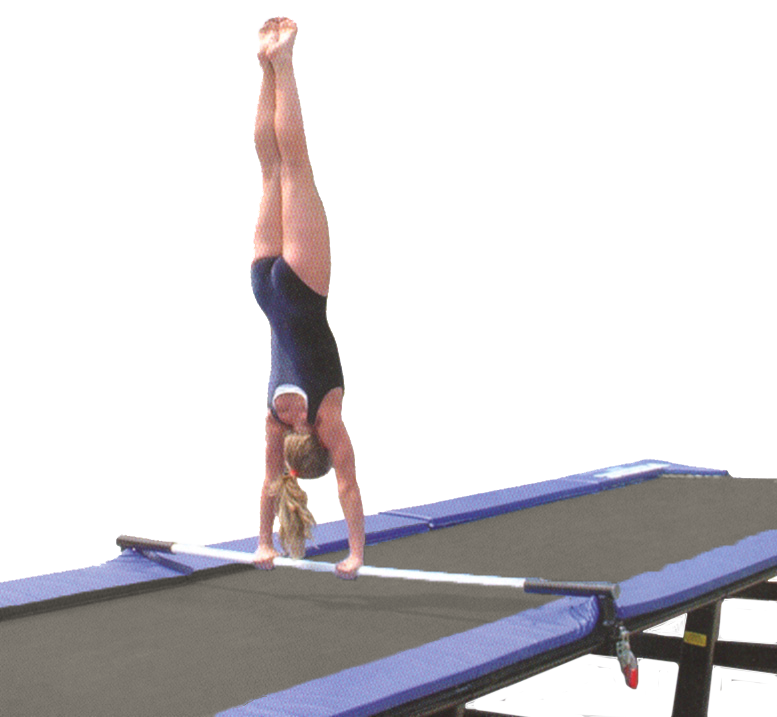 Train multiple forward and backward tumbling skills on the bed or landing in a portable pit. The PowerTrac can be permanently stationed or easily tipped on its side for storage. The PowerTrac is constructed of strong durable steel, but considerably lighter than most other brands. The steel frame is finished with a high gloss black powder coat paint. All floor contact points of the PowerTrac are cushioned by tough rubber feet. Frame padding is 1.4" x 12" cross-linked foam wrapped in our best 18 oz. vinyl. A special feature of the PowerTrac is the diagonally placed springs at the four corners of the unit. This provides the safety and convenience of being able to dismount from the very end of the bed and still have a firm footing and good rebound. The entire bed is double-sprung. There are about six springs per foot. Heavy 1/4" wire spring anchor strip is continuously welded to the inside of the top round tubular railing for spring hook-ups. This provides twice the strength and durability of conventional beds and reduces gaps and ripples on the tumbling surface. Springs are of the highest quality steel wire and plate finished with tapered ends. Easily clamp the innovative training rail anywhere on the PowerTrac for training most any bar skill. Great for teaching hollow tap handstands for giants, blind changes, pirouettes, and even Tkatchevs. Two coaches can move the rail on, off, or somewhere else on the track in 1-2 minutes. The rail is an actual competitive 40 mm uneven bar rail with full maple laminate. 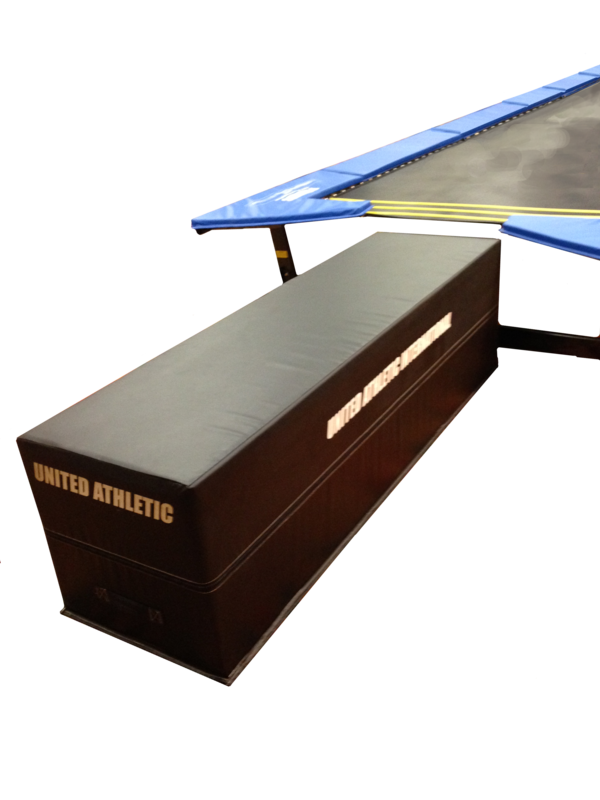 UPS Shipping Dimensions, 98" x 5" x 9"
The PowerTrac Power Incline is a great tool for training back handsprings. 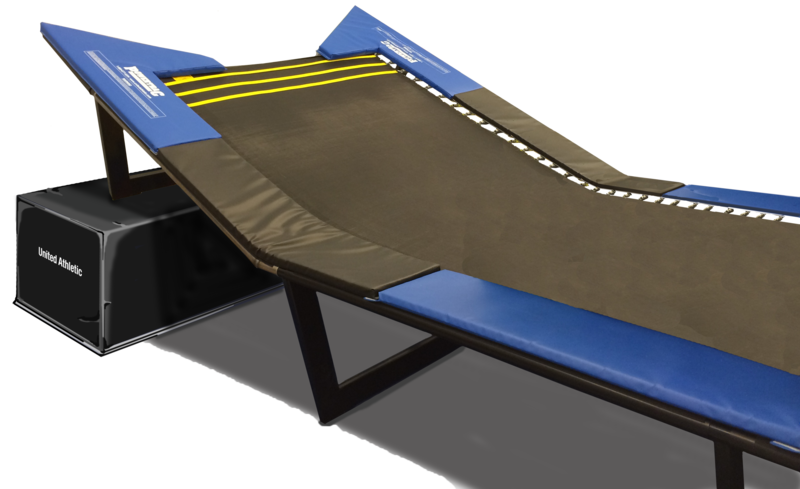 The incline essentially works just like a foam incline wedge on the floor except that the athlete can get a bounce push-off to help with the skill. Standing on the incline and pushing off forces the athlete to push back instead of up, teaching a long fundamentally correct body-length handspring. The Power Incline is easy to add to an existing frame and gives your coaches dozens of options for training new skills. 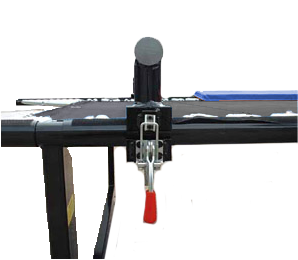 The Power Incline is constructed of strong durable steel, finished with a durable black powder-coat paint. All floor contact points of the PowerTrac Power Incline are cushioned by tough rubber feet. Frame padding is 1.25” x 12” cross-linked foam wrapped in our best 18 oz. vinyl. The Power Incline requires a stationary platform like our 28" H x 24" w x 84" long end block. 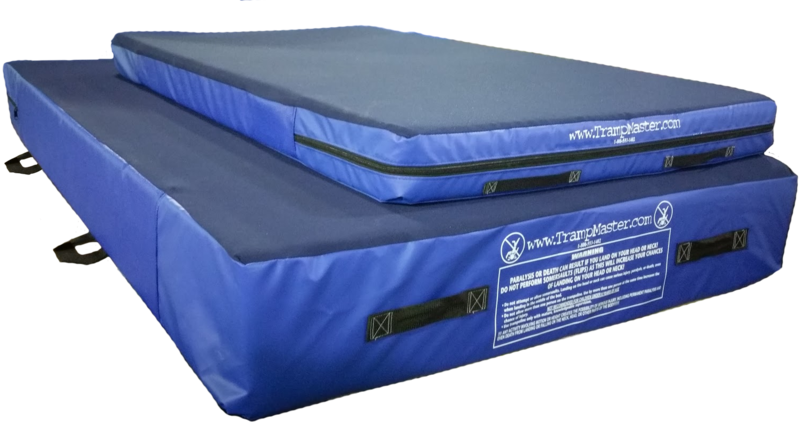 The 24” wide x 24” tall x 7’ long solid foam block can be turned either direction at the end of a PowerTrac to provide either a safety stepping station(sideways) or a 7’ extended mounting runway (longways). Made of heavy 90-pound polyurethane foam core wrapped by crosslinked foam and then covered in our heaviest 18 oz vinyl. Multiple colors available to match your frame pads or team colors. Any size PowerTrac can be made folding at the factory by installing our innovative hinge system and heavy-duty casters. Simply slide the protective locking sleeves back, flip the PowerTrac on its wheeled side, and fold the unit in half for easy rolling and storage. This is not an add-on kit and must be ordered as a folding unit from the factory. Existing non-folding units cannot be retrofitted in the field. 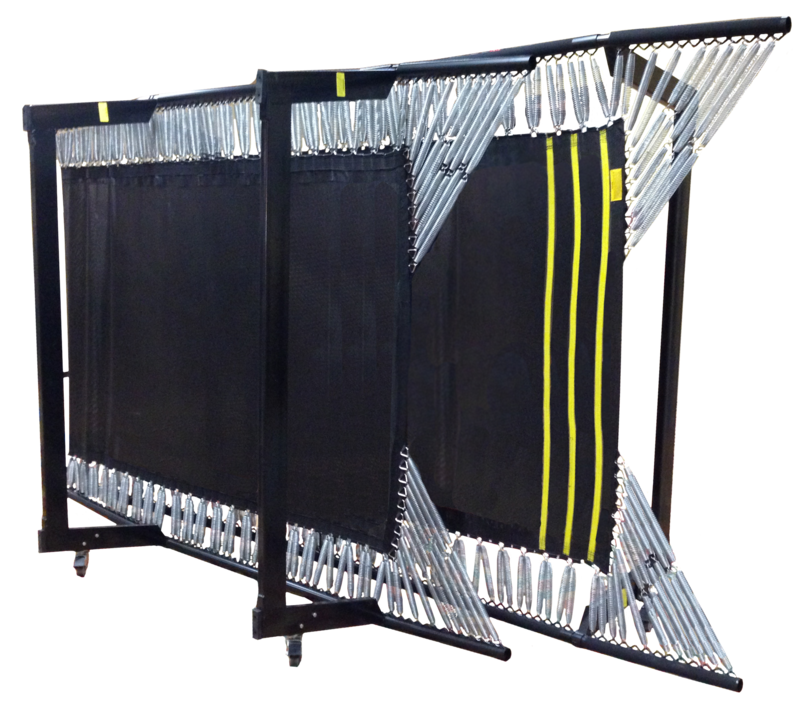 The PowerTrac has specially designed frame extensions and diagonal extension springing so that takeoffs from the end of the PowerTrac are similar to the interior of the unit. Since the PowerTrac allows for much more powerful dismounts, we accommodated a safer landing surface for more difficult skills by making the height of the takeoff surface match our T24” training pits. We recommend a minimum of 7’6” wide (The PowerTrac frame is 7’2” wide) and a minimum of 12’ long. It’s much safer to land difficult new skills in a real pit than just a training mat. We reinforce the short tops of the pits with triple-layer 18 oz vinyl so the springs can’t tear into the cover.